In case you’re not familiar with this kind of tool, the oscillating multi tool is a small handheld tool that operates by making very small movements, very rapidly, side to side (oscillates, hence the name). They typically have some method of attaching an assortment of accessories, including cutting blades, scraper blades, sanding pads, and more. The tools are excellent for cutting in tight places, on finished surfaces that need a precise cut, and sanding in corners no other sander could get to. Oscillating multi tools have been around for a number of years, but the big name tool brands have made some great advancements on this handy tool over just the last few years. In fact, I bought an oscillating tool from Craftsmen 5 to 10 years ago, before the advancements…while it had a number of drawbacks and things I would improve, I still used that tool a LOT! This multi tool is for a wide range of professional tradesmen, as well as the do-it-yourselfer working on home projects. It can be used to cut wood, metal, plastic, drywall, as well as sanding, scraping, or grout removal. 1. Takes the place of multiple tools – When I’m working on remodel projects, I keep this tool close by because it can be used in so many situations, various tasks, and in tight places. 2. The Quick Attach Feature – The multi tool I had before, a Craftsmen brand model, required an Allen key and screwing/unscrewing a bolt with washer every time I wanted to switch out blades/accessories. This DeWALT DCS355 has a quick attach feature that lets you switch out accessories simply by depressing a large, rather ergonomic, spring-loaded tab. Note: if you have blades of brand names other than DeWALT, they WILL still fit on this tool, but they will need to be screwed on/off with the optional allen key system. 3. Cordless 20v Battery Operated – I’ve gone almost completely cordless with my main set of tools: jigsaw, circular saw, miter saw, drills, and this multi tool…and that makes life on the job easier AND faster. Not messing with extension cords strung out everywhere is a relief! …And, it’s just so convenient to have the same batteries for all your tools. On bigger projects, I have a couple batteries charging at all times, and just switch them out with ones that are running low. 4. Dual-Grip Variable-Speed Trigger – The older tool I was used to working with had a simple On/Off switch. While that wasn’t a terrible nuisance, there were times you wanted to just quickly make a cut, or wanted to do something a little slower and precisely. With DeWALT’s variable speed trigger, you can do just that; just pick it up and quickly run it…at any speed you want. Very nice feature. The trigger is also “dual-grip” paddle, meaning it can be ergonomically used from two holding positions – closer up to blade, or farther back. And, for the jobs where you’ll be using the tool for a longer period of time, there’s a handy lock button that will keep the tool in the full-on position without holding down the trigger. 1. Cutting Blades Wear Out Quickly – this is probably not just an issue with DeWALT’s blades, but of all brands. Just be prepared to know ahead of time you’ll go through blades quickly. So I’d recommend you also buy extra blades when you buy the multi tool kit. 2. A Bit Heavier – this isn’t a big issue, but the tool is a bit heavier than the smaller one I had before, at about 3 pounds. But, it’s also more powerful and well built too, so that’s the trade off. You can get the DeWALT Oscillating Multi Tool from Amazon, with accessory kit (variety of blades and a storage box), from Amazon. Considering how often I use this tool around the house, it’s well worth the price. The battery charger, one DeWALT 20v Max 2.0Ah lithium ion battery, and the canvas contractor bag are all included. 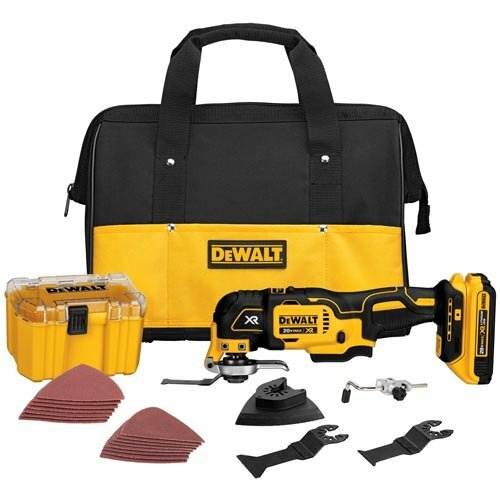 You could also visit DeWALT’s product page for this product for any other details not provided in this review. Otherwise, clicking here will take you right over to Amazon so you can get this puppy ordered and shipped out to you ASAP!